Discussion in 'Traditional Folders and Fixed Blades' started by Augie, Mar 29, 2018. 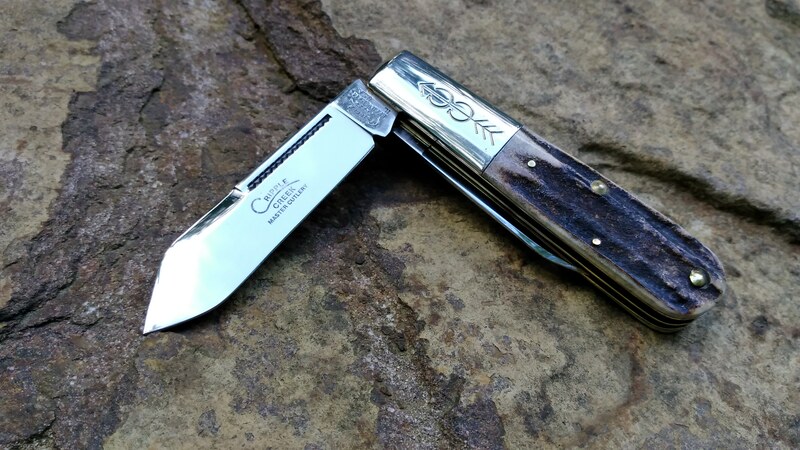 Hoping to get a thread going where everyone can post pictures of knives, documentation, links to information on Bob Cargill and Cripple Creek knives. I've searched the forum and unfortunately a lot of pictures have been lost and links are dead. I think these knives are important enough to traditional knife collectors that we need to keep the information going for future collectors. From what I understand Bob started out by doing repair work for Case and making custom knives before opening Cripple Creek Cutlery in 1981, I'm thinking this Barlow with just Cargill on the tang and the number 95 on the back of the tang may be one of the early custom made knives. really a beautifully made knife, great stag and a spear blade profile that looks a lot like the spear on the late 1800's English Barlows. suqueue22, Boxer .45, Fox79 and 22 others like this. This Barlow is a club knife from Cripple Creek Knives, this one appears to be limited to 30 knives. This one came in a box marked in pen with the knife description and had an insert in the box. Really nice jigging that I understand Bob did by hand. suqueue22, Fox79, skyhorse and 14 others like this. I hesitated on a Cripple Creek Eureka jack over on AAPK that's gone now. Should have grabbed it, but I was ignorant about the value. Bob made them by hand himself, and that's just awesome. They look really fine. Pàdruig, Fox79, Fodderwing and 14 others like this. Nice bunch you are posting, Augie. I had a couple but traded them away, mostly. I always liked these Barlows because they carry my initials! I still have one of them. The "Uncle" Barlow is a pre-CrippleCreek Cargill. Pàdruig, Fox79, skyhorse and 11 others like this. I like the spear and swedge on those barlows! I'm not usually a spear point fan, but those look extra pointy to me for some reason. I'm pretty sure they were made under Bill Howard's leadership - at Queen! mrknife and Augie like this. I'll leave my entry here. Great thread. Duckdog, Fox79, skyhorse and 6 others like this. Nice ones guys, the Queen made ones are from after Bob sold the company from what I understand and are well made knives. The shape of the spear blade is very close to the original Knife World spear. Charlie, that Uncle Barlow is a great knife and probably a better size for use and cary than a Granddaddy Barlow, it has very eye pleasing proportions to it. Pàdruig, Duckdog, Fox79 and 8 others like this. I have a friend up by Monett, Mo. who wanted to learn how to make pocket knives. He approached Bob and was turned down. Later he got a call from Bob who told him to come to his shop. Bob had the contract for the 4000 Knife World first knives and was behind. My friend learned on the job helping to finish the last of that group. Fodderwing, Augie, JTB_5 and 1 other person like this. Charlie, your top 2 are Effingham IL knives. That would have been during the Blackjack period, correct? Was Queen under contract with Blackjack at that time? neat, they come in single blade! Here’s my only Cripple Creek. Very stout feeling knife. Old Engineer, Pàdruig, Duckdog and 3 others like this. I have a few Cripple Creeks. And yes, the barlows with the CC and arrow were made by Queen when Black Jack (Effingham stamp) was producing a few patterns of Cripple Creeks. and was most likely made outside of the Black Jack shop. Concerning post #10 above, there were 2000 of the 1st Knife World knives. That is by far the most of any one pattern that Cargill made. With most of Cargill's time in 1982 being spent on this project, any other knife pattern with a '82 stamp will be low in number. Fodderwing, Duckdog, Fox79 and 9 others like this. Few more. Some of the images were taken years ago with a point and shoot camera and aren't as quite as detailed as others. Duckdog, boykinlp, skyhorse and 11 others like this. Greg, thanks for posting, that Saddlehorn is fantastic. The Firestone Barlow with 10 carat gold shield. A Sowrat or Muskbelly. Notice the curve in the barlow. It keeps the tang from snagging in your pocket. Notice the different master blades in the 2 shown below. Duckdog, Fodderwing, boykinlp and 6 others like this. Cargill called his reddish bone Strawberry. Duckdog, Fodderwing, FLymon and 4 others like this. A few Cripple Creek Barlows that were made by Bob Cargill. Notice the sunken tang on the Barlow without the curved frame. I've got a few more but I don't want to bore you guys. Pàdruig, Augie, Duckdog and 10 others like this.